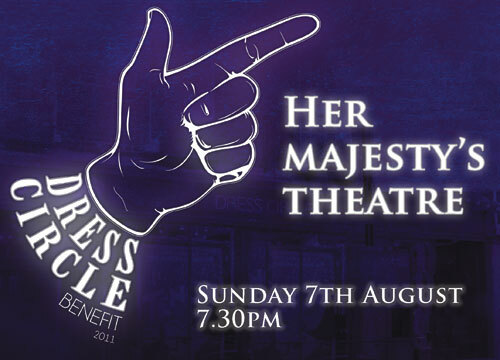 The benefit Gala to try and save the Dress Circle Shop in London’s Monmouth Street from closure is being held on Sunday 7th August at 7:30 pm at Her Majesty's Theatre in London’s West End. It will be an evening of celebration crammed with musical theatre performers from across the world backed by a 33 piece orchestra conducted by Simon Lee. The evening will be hosted by Aled Jones and features performances from John Addison, Helen Anker, Jonathan Ansell, Rosemary Ashe, Julie Atherton, Samantha Barks, Tracie Bennett, Mark Bonnar, Norman Bowman, Daniel Boys, Rebecca Caine, Anita-Louise Combe, Kim Criswell, Portia Emare (The Idolls), Shaun Escoffery, Josefina Gabrielle, Tiffany Graves, Ashleigh Gray, Ellen Greene, Jodie Jacobs, Ramin Karimloo, Alexia Khadime, Joanna Kirkland, Debbie Kurup, Sarah Lark, Emma Lindars (The Idolls), Simon Lipkin, Gary Milner, Claire Moore, Robyn North, Landi Oshinowo, Steven Page, Malinda Parris, Dianne Pilkington, Peter Polycarpou, Stuart Matthew Price, Lara Pulver, Zoe Rainey, Charlotte Riby (The Idolls), Jon Robyns, Frances Ruffelle, Caroline Sheen, Emily Tierney, George Ure, Hannah Waddingham, Stephen Webb, Jayne Wisener. (All artists are subject to availability). Les Miserables, Miss Saigon, The Phantom of the Opera, Parade, Avenue Q, Rent, Witches of Eastwick, Dreamgirls and Wicked!. Backed by a 28-piece orchestra, the gala presents the opportunity to hear this music on a scale very rarely heard.